A ten-day festival to paint the town. 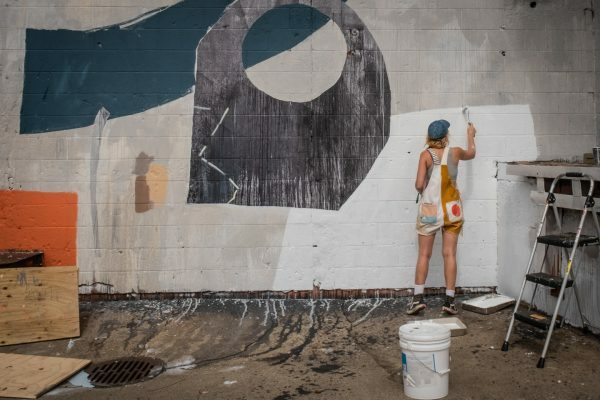 More than 50 artists at work and play on the streets of the Eastern Market. One brilliant stroke of creative marketing genius for the city of Detroit. 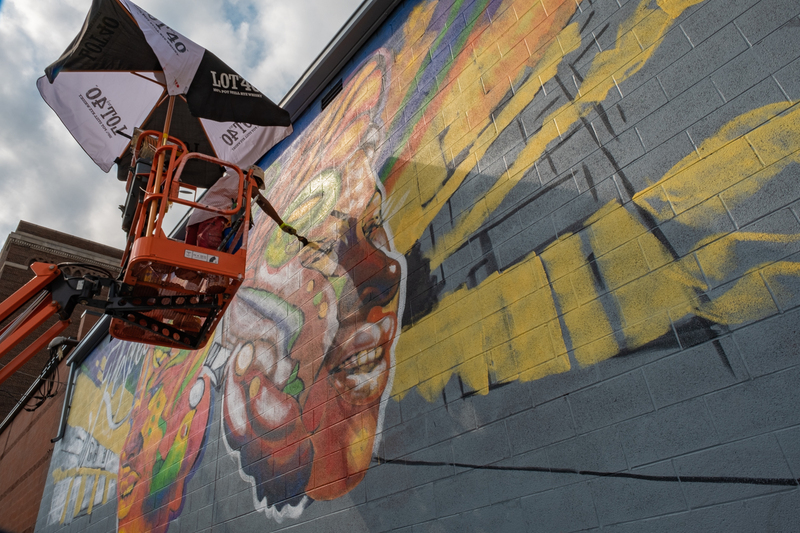 This was the 4th Annual Murals in the Market, a live arts event hosted by 1xRUN (“one-time run”) in September. With its consistent celebrity-loaded line-up of artists, including many locals, Murals in the Market has built its reputation as a premier event drawing international notice to the city. Recently named by Smithsonian magazine as one of “The Top 5 Mural Festivals in the World,” Murals in the Market continues to enhance the Eastern Market as a must-see destination and living proof of the district’s transformation and continuing economic development as a magnet for fine art, foodies, neighborhood regulars, as well as tourists from around the world. 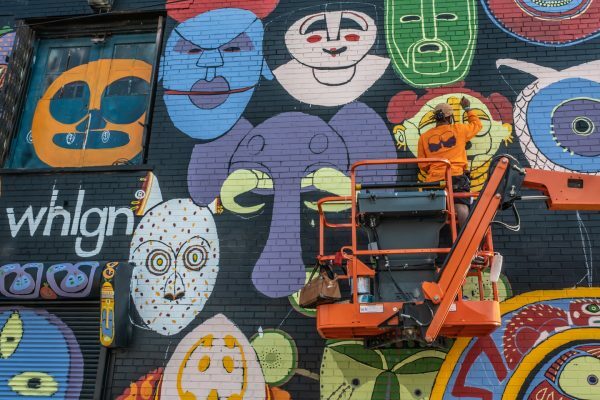 To date, 1xRUN and the company’s fine art gallery, Inner State, have curated and produced over 150 murals in Eastern Market alone, as well as many more murals strategically placed throughout the city of Detroit. 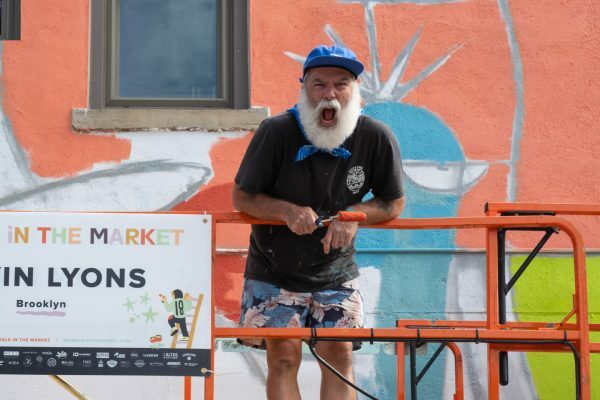 From its grassroots start-up in 2015, Murals in the Market has solidified an impressive roster of sponsors. With the promotion and financial support of presenting sponsors including the William Davidson Foundation, the Knight Foundation, Quicken Loans Family of Companies, Eastern Market Corporation, the 1xRUN team now works year-round on the event from its new headquarters near the Heidelberg Arts Project at 2905 Beaufait Street in Detroit. As colorful as are the artists at work brushing and spraying gallons of paint on bricks and concrete, so too are the people we meet on the street, those living, working and playing in the market district and its neighborhoods. 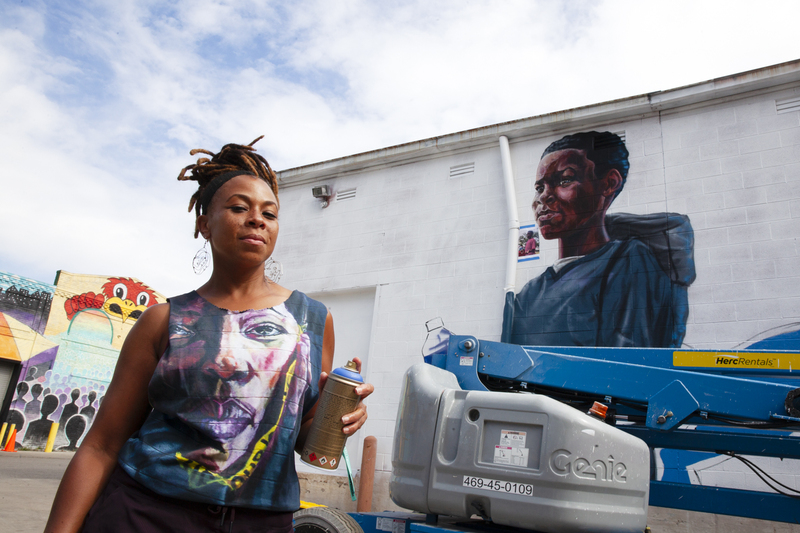 Here we meet a house painter-poet, on hand to assist Detroit muralist Charles Chazz Miller with “Respect,” a portrait of Aretha Franklin in the alley between Riopelle and Orleans Streets . . . There’s Cassie, a graphic artist and Lexus Velodrome cycle racing enthusiast, just casually pedaling by. There’s Derrick on skateboard, testing the new Community Push pop-up skateboard park installation in the alley between Riopelle and Orleans streets. And there’s Linda – “Feet on the Street” lady, inveterate market tour guide and historian. Photo op with Linda Yellin, “Feet on the Street” tour guide at Olayami Dabls’ eye-popping mural of mirror-constructed for Murals in the Market 2016 along Wilkins Street. 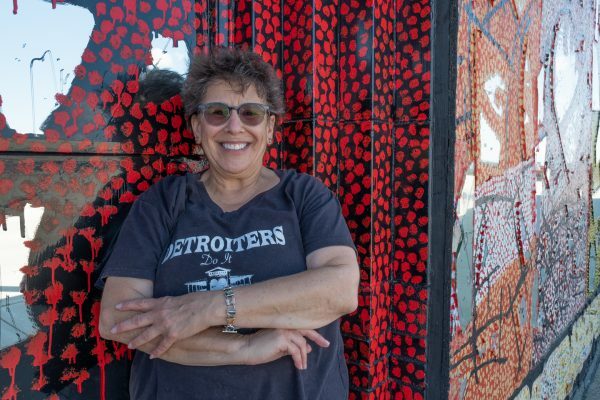 A retired social worker, resident of Detroit’s Lafayette Park and a self-described Eastern Market groupie, Linda Yellin has been conducting city tours and market tours year-round for nearly two decades. 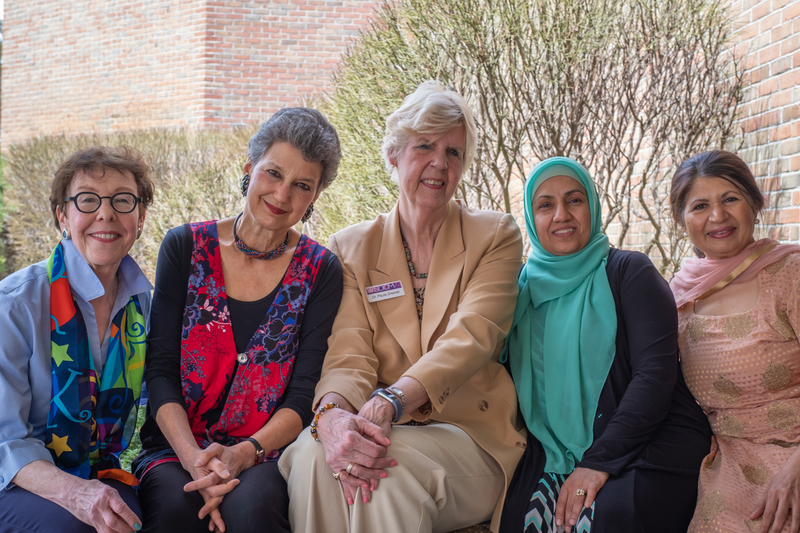 What started out as a hobby and a call for volunteers to run tours in celebration of Detroit’s 300th Birthday in 2001 turned into a business for Linda in 2007. Today, she runs private and group tours for schools, universities and visitors of all ages from all over the world. So many fine, fine artists to meet during the Murals in the Market festival . 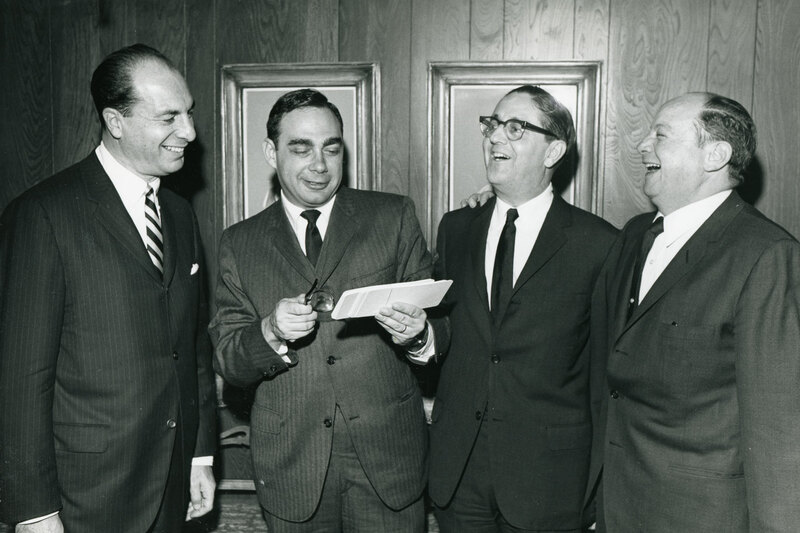 . . myJewishDetroit stopped to chat with just a few. Never a dull color, Kevin Lyons paints with vigor and humor and greets the camera lens with his signature roar. Creative director, designer and illustrator Kevin Lyons returned to Detroit for Murals in the Market for his third year. To date, his humorous Monster characters have appeared on the walls in Milan, Paris, Tokyo, NYC, LA, Detroit, Honolulu and D.C. With a body of work exhibited and published worldwide, Kevin also has created products with Nike, Adidas, Converse, Huf, Girl Skateboards and others. I do research for my work in an anthropological way, drawn to objects. My composition, “Busy” is a collection of found objects in the Market. There’s a vintage Ford motor, a candle I found in a shop, a Faygo bottle, a watermelon from a produce shop . . . the Eastern Market reminds me our of festivals in Buenos Aires… so much life, so much to see! Known in the top ranks of the L.A. art scene, Luke Chueh employs minimal color schemes, simple animal characters and style that balances cute with brute, walking the fine line between comedy and tragedy. Working with 1xRUN for more than a decade to produce prints and limited editions, Luke was invited to Murals in the Market in the inaugural year of the event and returned to do his second mural this year. Bisco Smith (working in partnership with his wife and business manager, Jasmine) is an American contemporary urban artist whose work is characterized as a blend of graffiti deconstruction, abstract gesturalism, action painting, and style writing. His technique involves energetic, expressive brushstrokes that reflect the flow of music and translates the consciousness of the moment into painted lyrics and abstract black and white works of art. Based in Detroit, Michigan, 1xRUN (“one-time run”) is a leading publisher of fine art editions and online destination for original art, showcasing limited edition prints, original artwork, books and exclusives from some of the best-known and emerging names in the new contemporary movement. With collectors in over 100 countries, 1xRUN has published more than 1,300 editions since 2010.